Apologizing & Condemning… Until When? Until when will I be able to wake up and just take a deep breath not tainted with sadness and distress? Until when will the bloodthirsty savages who have their own horrifying agendas stop causing terror in the name of the faith I so visibly represent? Until when can I stop feeling the pressure to constantly clarify to the world wide web, by the way guys, all Muslims aren’t like this, we’re actually normal people… like you! Normal and safe, don’tcha worry about a thing? Until when can the very same Muslims who apologize and condemn acts of terror, not also be recipients of attacks themselves from their own neighbors and citizens moments later? These murderous imbeciles, if you take the time to read up on their backgrounds, are never actually religious Muslims. So you know those Muslims you stumble on in the restroom washing their arms because they’re making ablution to pray during their work day? They’re not the enemies. Those Muslims fasting sweltering hot long days in the summer without drinking water? They’re not the enemies. Those Muslims reading out of their little Arabic Quran book on public transport? They’re not the enemies. 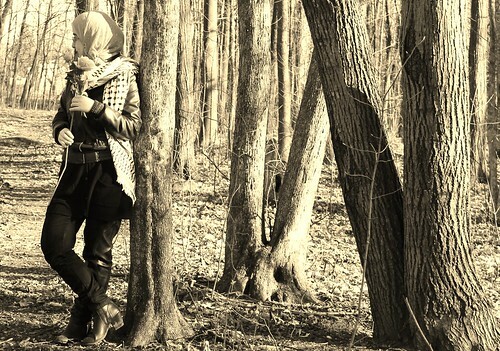 Those hijab-donning, long-sleeved, even face-veiled women you see at the malls? Not the enemies. Those brown-skinned men with the long beards who carry prayer beads as they stroll out of a masjid? They’re not the enemies. But, but, most people protest exactly as the sensationalized media trained them well to, what else is motivating ISIS (Da’esh) to blow up people in the West if it’s not Islam? it is the same reason that they see no issue with bombing inside the holy city of Medina, Saudi Arabia, close to where the Prophet of Islam, Prophet Muhammed ﷺ, rests. How can you even think for a moment these cowards have any true intrinsic motivation remotely inspired by Islam? Even the most backwards and ignorant fools who completely misinterpret the Quranic text couldn’t draw the same conclusions – to bomb the tomb of the Messenger of that faith! So in whose name do they dare claim to be while they drown the streets with blood? as a human being who happens to be Muslim, every time I hear the grave news, I feel the silent pressure from all sides to denounce something. Like a box that squeezes to you closer and closer, trying to suffocate you. When headlines have to specify that the attacker(s) claimed faith is Islam, I feel like it is ridiculously obvious to all that this “fact” has no logical correlation with the actual motives of the cruel actions taken. I rather prefer not giving the criminals any further spotlight, fame, and space on my social media platforms in my condemnation of them. If this seems like an insensitive thing on my part, then please consider this: I am a human being who also happens to be a Palestinian Canadian. My people in Palestine have been getting killed and abused for over half a century, just about daily. My heart is in turmoil always, bearing also in mind that human beings have been dying everyday in Iraq, Afghanistan, Burma, Syria, for as long as I can remember, and in so many other places around the world that it’s hard to breathe just thinking about it. But if I have to condemn every single death around the world as it happens, I will spend the rest of my days condemning verbally but not actually helping anyone. You’ll just have to take my word that whether I post a condemnation status for an attack or not, my heart bleeds with the pain of it all, for the pitiful state our humanity has sunk to. Despite my preference to not shine the spotlight on the terrorists – because for sure it was one of the results they wanted – I am finding myself doing more condemning than ever these days anyways. Like it has been for a lot of Muslims – a long painful journey – I have learned the difference between being a Muslim who condemns acts of terrorism, and between being an apologetic Muslim who shrinks whenever some madman claims his faith (which is also her faith) inspired him to blow himself up around civilians. The former is good, the latter is not. Perhaps it shouldn’t bother me as much as it does, but I find it agonizing even when people say things like, “as a Muslim, I condemn terrorism!” But why do we need to clarify that it is because we are Muslim? Can’t we just embrace our humanity and say “as a human being, I condemn inhumane acts?” There’s that lingering notion that Muslims somehow secretly support these acts, and we have to be very specific in pointing out that this Muslim does not! There is a fine, fine line between being a Muslim who condemns, and being an apologetic Muslim; and I am tired of trying to balance myself on it so as not to fall into the apologetic Muslim pit. I will never apologize for the actions of people like Da’esh (ISIS) because I do not associate myself with them in any way, shape or form. (Be assured that no truly believing and mentally sound Muslim actually buys ISIS’s shitload of ideas.) But I condemn their actions with every fibre I have. implore Allah (God) to send His wrath on them, destroy their plans of mass destruction, sow the seeds of doubt and painful uncertainty in their hearts in this life and may they suffer for their actions in the eternal hereafter. I simply do not have the patience to pray for their guidance, when they have so clearly chosen the path of woeful misguidance. There are others around the world who need my thoughts more than they. Until when will we be able to wake up and just take a deep breath not tainted with sadness and distress? Only Allah knows, for He knows Best. Thank you so much for reading and sharing! It means a lot. Much love. You bring a needed perspective through your post, I’m honored to share it. I found your post through tmezpoetry. Excellent piece. You and I are not of the same religious faith, but we are of the same psychological belief. When madmen kill others, I am shattered; you are shattered. I am not to blame; you are not to blame. The world seems to be splitting into two distinct parts – the lovers and the haters. I will pray with you that God will “destroy their plans of mass destruction, sow the seeds of doubt and painful uncertainty in their hearts in this life,” that people will stop killing in the name of their god, and that the blame will be set on the shoulders of the haters not the lovers. Thank you so much for your comment, Rose. You are exactly right, when we allow ourselves to become divided out of fear and prejudice, we give the haters more reign to continue to do whatever it is they are doing. It’s what they want, and we can’t give in to it! It is such a shame that ISIS is corrupting such a beautiful, timeless culture and all its people. Loved and enjoyed your heartfelt words and reasoning. Alas, there are just too many ignorant so-called human beings in this world that follow the word-wide-web so blindingly -again, such a shame and a disgrace. If only more true human beings took the time and made an effort to separate fact from speculation and rushed speculation. Knowing very little of Islam, and Prophet Muhammad -mostly from my research via world-wide-web and from library books, I cannot say or see how Islam or any real Muslim would condone such cowardly acts of violence and promote such intolerance. Thank you so much for your kind words and sharing your thoughts, I appreciate it! Very well writtened. Only if we could explain this to each and every person who is trying to blame ISLAM for such awful bloodshed. Whats weird is that they dint realize how ISIS is killing Muslims as well all around the world, so how could they be associated with Islam in anyways? SubhanAllah. What more clear proof they need! Jazakallah for such insightful writing. Jazaki Allah khair for taking the time to read and share your input! Thanks so much.